Like food, alcohol is often seen as an all-round solution. Had a good day? Reach for the bottle of wine to celebrate. Had a bad day? Drown those sorrows in a straight up whiskey. The perception of alcohol is that it can either emphasise the good, or minimise the bad, and many people drink to make themselves feel better. The question is - is this beneficial to our health? Does alcohol really make us feel good, or can it trigger an influx of negative thoughts? Serotonin is a word that’s frequently thrown around, but very few of us actually knows what it means. Serotonin is a type of serum that’s found in the blood, and although the majority lives within the digestive tract, it’s also commonly found within the brain. Serotonin is often referred to as a ‘feel good’ chemical. While we can’t scientifically prove that serotonin is the primary factor in making us feel good, what we do know is that patients suffering with depression frequently display lower levels of serotonin in the brain, and that lower than average levels have also been found to go hand in hand with aggression, irritability, and disorders relating to eating and sleeping - all classic symptoms of depression. The link between serotonin and depression is so strong that one of the most common types of antidepressant medication is SSRIs - selective serotonin reuptake inhibitors - which increase the amount of serotonin in the brain. So what’s alcohol got to do with all this? Studies have found that within just 45 minutes of drinking alcohol, serotonin levels in the brain drop significantly, to a point where they’re on par with the levels of a depressed patient. 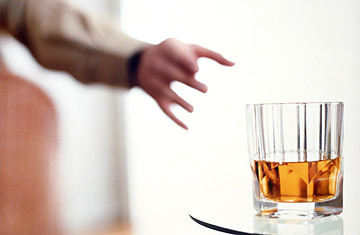 This is thought to be the reason why many people become sad, violent, or melancholy after drinking. It’s important to remember that there are two sides to every story, and there are studies out there which claim to debunk the ‘myth’ that alcohol and depression are related. Jewish men, for example, are very vulnerable to developing depression - a whopping 13 percent of the male Jewish population suffer with some degree of depression compared to 5.4 percent of non-Jewish men. However, Jewish men also tend to consume much less alcohol, with 2.8 percent misusing alcohol, compared to 14 percent of non-Jews (‘misuse’, in this instance, refers to anything above the recommended daily allowance). Of course, there could be other factors at play here - in fact, it’s very likely there are - but this is a common comeback from researchers in the field when alcohol is linked to depression. Saying that alcohol causes depression is like saying that smoking causes cancer, that running will cause injury, or that crossing the road will cause death. What alcohol does is increase the risk of depression, but it doesn’t necessarily cause it. Despite those who try to argue otherwise, there is enough evidence out there for us to assume that there is a solid link between alcohol and depression, but it’s much more complex than simply saying ‘alcohol causes depression’. Anna writes for Bio Balance a treatment center for depression in Ireland. I can't drink anything with alcohol thankfullly.I guess alcohol companies were very successful in promoting their product as something to drink in both good and bad times. Alcohol actually cures depression. Temporarily that is! Most people have the wrong impression of what alcohol can do to them. All I know is whatever the objective the drinker has before that first sip, the effect is temporary. My alcohol tolerance is very low. A few sip can make my skin look like a map - complete with redness and itchiness. just like joanne i had low tolerance of alcohol..but lets not blame alcohol as cause of depression. just like anything in this world..anything too much is bad! I'm not an alcohol drinker, so I don't know if it cures or it can cause depression. I've seen a lot of people get in trouble when the alcohol is in their system. IT makes depression a lot worse, I've seen it from my father when he was still alive. I have known serotonin long before. It's the culprit when we have our monthly thing and we get too moody. Hahaha! As for alcohol, I never drink alcohol or anything with alcohol. I experience shortness of breath when I do. Like everything in life, drinking must be done in moderation and when they drink, never drive!